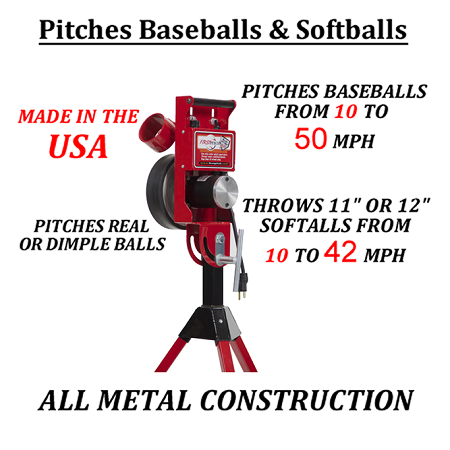 The newest in the First Pitch lineup of American made, pro-grade pitching machines, the First Pitch Relief Pitcher is their most affordable machine yet. 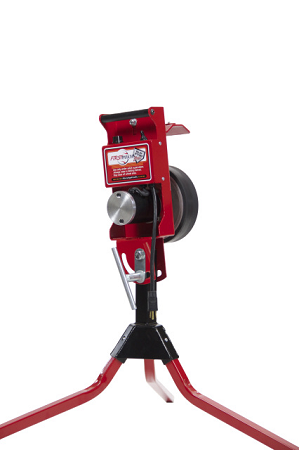 Made out of steel and aluminum, the all metal First Pitch Relief Pitcher pitching machine is both lightweight and sturdy. Its Lesson/Minarik DC drive motor is also made in the USA and throws dimpled baseballs from 10 to 50 MPH. It can throw softballs up to 42 MPH, too! 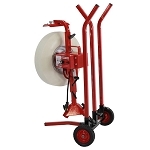 The First Pitch Relief Pitcher pitching machine comes with two ball chutes that can easily be swapped out for baseball or softball and it has reversible legs so that it can be set up to throw from softball or baseball pitching height. Toggle knobs make pitching machine adjustments a breeze - no tools at all are required. Not only great for hitting, you can use the Relief Pitcher for fielding practice; too, it's great for defensive drills, capable of throwing fly balls and grounders. The First Pitch Relief Pitcher comes with a full 1-Year manufacturer's warranty and a 14 day money back satisfaction guarantee. It is powered by any standard 110 volt electrical outlet. Please remember to protect your pitching machine with a portable baseball screen or a backyard batting cage and don't forget to add dimpled First Pitch dimpled baseballs or softballs to your order. PLEASE NOTE: The First Pitch Relief Pitcher pitching machine WILL NOT work with their auto ball feeder, so balls must be fed in manually, one at a time. Also, unlike other First Pitch machines that use inflatable tires, the First Pitch Relief Pitcher uses a hard wheel. Because of that, you should only use dimpled balls with this machine. Regulation baseballs or softballs will not only seriously degrade the pitching machine wheel, but they will become soft and have their covers ripped off of them almost immediately. Can be used with dimple baseballs or softballs - even lite balls! Q: What size generator do I need to run this? A: The type of generator you use affects the wattage output you need. Gas powered generators typically need less power output than if you are using a 12 volt battery and an inverter to generate electricity. The most important thing to take note of is that you need to look at the "Continuous Duty Watts" of the generator (or inverter) - not the start-up watts (just ask someone at the hardware store). Q: Can you connect an automatic feeder to this? A: The First Pitch Automatic Ball Feeder DOES NOT work with this pitching machine. Balls must be fed in manually. A: I'm not exactly sure what you are intimating in the first part of this question. If you are saying it would be preferable to have a machine with an automatic ball feeder, the First Pitch Relief Pitcher is not it. It is the only baseball or softball pitching machine First Pitch makes that cannot be used with the First Pitch Automatic Ball Feeder. If you are saying that her mother will always be there to feed balls into the pitching machine, that's another story. The only problem is, this particular pitching machine has a maximum softball pitching speed of 42 MPH, which is what 10 year olds throw and considerably under what high school girl softball pitchers throw (they tend to pitch in the mid 50s to low 60s). With that in mind, the best machine for you is probably the First Pitch Baseline Pitching Machine, which can throw baseballs or softballs and has a top speed of 60 MPH with softballs. The Baseline pitching machine can also be used with an the automatic ball feeder, which may or may not be important in your case. The Baseline costs nearly twice as much as the Relief Pitcher, so that is always a factor to consider, as well. You could always move the Relief Pitcher much closer to the plate, which will make it seem like it is throwing faster. Then, there is the fly ball situation. Obviously, a machine like the Baseline will throw higher, longer fly balls than the Relief Pitcher because it has a 42% higher top speed. I should also point out that a feeder won't help at all with fly balls because the Baseline is back-fed and there is no way to get balls rolling down a feeder to then go uphill into a pitching machine that is pointing upward, so the feeder compatibility advantage the Baseline has over the Relief Pitcher is useless for fly balls (a feeder works perfectly well for grounders, however). Finally, your question about balls ... Every pitching machine manufacturer recommends using dimple balls instead of real balls for various reasons but the most significant one is that real balls have covers that are glued to them. Squeezing a ball between pitching machine wheels and a stop plate eventually breaks that glue, the balls get mushy and the covers soon rip off of the balls. This is especially true of softballs which have even thinner covers than baseballs do. Dimple balls are the same size, same weight and same hardness as a regular softball, so there should be no practical difference between a dimple ball and a real softball, other than dimple balls are pretty much indestructible. A word of caution; however, never leave dimple balls out in the rain. If you do, they will become heavier and harder than a real softball, which could damage your daughter's bat. This is where the false belief that dimpled balls damage bats comes from. Public batting cages leave their balls out in the rain. A First Pitch Relief Pitcher pitching machine can throw any dimpled pitching machine baseballs, lite balls or regulation baseballs. If you are going to use regulation balls, please only use the highest quality leather balls and realize that they will not be as accurate as dimpled balls. Also know that the seams on real balls will wear your pitching machine wheels out faster and that pitching machines are known to rip the covers off of real balls - especially softballs, which have very thin covers. 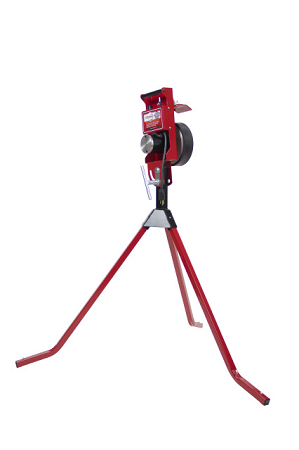 To ensure your satisfaction, the Relief Pitcher pitching machine includes a 14 Day Money Back Satisfaction Guarantee. Returned items must be in good, resellable, "like new" condition with original packaging. Unless returning an item that is defective, customers are responsible for the return shipping costs to First Pitch as well as the original actual shipping costs, whether they obtained "free" shipping or not. There is also a 10% restocking fee on all returned items. First Pitch warrants the operability of your Relief Pitcher pitching machine for 1 year for residential use or 30 days for commercial use from the date of purchase. This warranty covers all mechanical and electrical parts against premature wear or failure, electrical malfunction, or accidental damage during reasonable normal use. NOTE: Because tires and motors are wear items, they will be covered under the warranty as a pro-rated item. No matter where you order a First Pitch Relief Pitcher Pitching Machine from, NOBODY actually stocks them; they all ship directly from the manufacturer's warehouse located in Maple Plain, Minnesota. Therefore, the shipping time frame is exactly the same no matter what website you order from (we hope that it is this one!). First Pitch Relief Pitcher Pitching Machines typically take 2-4 business days to ship from the time you place your order. They ship via Federal Express (FedEx) Ground and could take anywhere from a day or two to a week to get to you AFTER being shipped, depending on your proximity to their warehouse. We will notify you of your tracking number the moment we receive it from the manufacturer's warehouse. Click here to download an easy to read, printable PDF of the First Pitch Relief Pitcher Pitching Machine Owner's Manual.